The Battle of Hamel, which occurred on the 4th of July 1918, was the shortest successful "battle" of the First World War, lasting only 93 minutes. It also marks the first offensive combat operation of US forces on the Western Front. 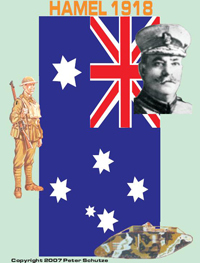 Although the four American companies are shown in the game as separate units, historically they were spread amongst the Australian battalions in platoon lots. The integrated, combined arms attack plan employed by Australian General Monash set the pattern for later and larger attacks, notably Amiens. Key features of this combined arms approach included placing the combat Tanks under direct control of infantry company commanders and using both supply Tanks and airplanes for ammunition resupply. Ken Filewood 9 8 6 Based on reading only: Clear, well written rules with interesting, well researched mechanics and elegant graphics. Probably a bit slow and fiddly to play.